Alongside history, I majored in English and French. (The three, rather than two, majors were due to the fact that I would qualify to enter a scholarship competition organised by the French government to study on Réunion for a month, if I took French in my third year. I did, and I won.) In French we had a thorough introduction to literary traditions of France and her colonies. In English we had a thorough introduction to French literary theory. In fact it felt like we were reading more French writers in English than in French. The only writer who we read in both classes was Roland Barthes, and, more specifically, his Mythologies. In French, Mythologies was part of a discussion of the writing of the 1950s and early 1960s, and in English it was used to demonstrate the intellectual poverty of structuralism. As an unreconstructed structuralist, I love Mythologies, a collection of short essays on aspects of French culture, from striptease and plastic, to detergent and the depiction of Ancient Rome on film. I was reminded of them recently when I read that a new, unabridged translation is about to be published. In an article in the New Yorker, Marco Roth makes the point that these essays have a similar quality to short blog posts, and I think that this helps to account for their continuing popularity. Michael Zipperstein had come to Brown thirty-two years earlier as a New Critic. He’d inculcated the habits of close reading and biography-free interpretation into three generations of students before taking a Road to Damascus sabbatical, in Paris, in 1975, where he’d met Roland Barthes at a dinner party and had been converted, over cassoulet, to the new faith. The inclusion of the cassoulet is important: part of the allure of France is the food. It’s delicious – of course – but a knowledge of, and liking for, a particular kind of French cuisine is a signifier of sophistication. Barthes was acutely aware of this: he understood that some forms of cooking in France were (and are) considered better than others. Some of his best known essays are about food: about red wine, steak and chips, and the Elle recipe pages, and it’s in his analysis of Elle that he draws a distinction between different French cuisines. Compare with L’Express, whose exclusively middle-class public enjoys a comfortable purchasing power: its cookery is real, not magical. Elle gives a recipe for fancy partridges, L’Express gives that of salade niçoise. The readers of Elle are entitled only to fiction; one can suggest real dishes to those of L’Express, in the certainty that they will be able to prepare them. L’Express would be more likely to include bourgeois, country cooking, while in Elle a ‘country dish is admitted only as an exception…as the rustic whim of jaded city-dwellers.’ The cuisine introduced to Britain by Elizabeth David – exemplified by the cassoulet – would have been rejected by Elle as too ordinary – as inadequately ornamental – but would have found a place in L’Express. It wasn’t only David who introduced a kind of French cooking which seemed to be new and less fussy to Anglophone eaters accustomed to the prissy and elaborate haute cuisine of the cordon bleu school. Americans were some of the earliest translators of bourgeois cooking. We tend to think immediately of Julia Child and her co-authored Mastering the Art of French Cooking, the appeal of which – alongside her television shows – was based partly on the fact that she had actually lived and trained as a cook in France. But before her there were Gertrude Stein and, more importantly, Alice B. Toklas. Toklas’s eponymous recipe book is probably best known for its ‘haschich fudge’ contributed to the ‘Recipes from Friends’ chapter by the artist Brion Gysin who notes that ‘it is thought to be good for warding off the common cold in damp weather.’ I’ll bet it is. The book is, though, considerably more than this recipe. I’ve been meaning to write about Alice B. Toklas for a while, and considering that she died at the beginning of March and was born at the end of April, now seems a sensible time to think about her. Rather like Stein, she’s been subjected to a posthumous process of cuddlification: they’ve become the eccentric, fluffy, travelling Jewish lesbians who somehow – somehow – managed to survive the Nazi occupation of France and the Vichy goverment. Being only one, having only one pair of eyes, having only one time, having only one life, I cannot read your M.S. three or four times. Not even one time. Only one look, only one look is enough. Hardly one copy would sell here. Hardly one. Hardly one. She is better known as a collector of writers, artists, and art in her Paris salon, which she held during the 1920s. She and her brother Leo moved to Paris in 1903, and she came to wider, public notice with the publication of The Autobiography of Alice B. Toklas in 1933, an homage to – and also a kind of exploitation of – her lifelong partner. Toklas, who had had lived with Stein since 1909, ran their household in Paris. ‘Why not?’ asked the young publisher from New York who had been trying to persuade her to write a book about her life with Gertrude Stein and about the many people and adventures they had shared. ‘What I could do,’ she said as tentatively as we was able, which was not very, ‘is a cook book.’ And then, ‘It would, of course, be full of memories.’ She kept her promise. The book is tremendously entertaining, and I first read it from cover to cover, like an autobiography. I particularly like her chapters on cooking for artists (Picasso was on a diet at the time) and killing animals for eating. The only recipe I’ve ever cooked from it was for a mushroom and scrambled egg sandwich filling which was so rich I had to lie down in a darkened room afterwards. It is a delightful memoir and it’s Toklas’s emphasis on light, rather than shade or darkness, which renders it misleading. The chapter on servants demonstrates that Toklas, who described herself as secretary-companion to Stein, lived so comfortably that she was not responsible for cooking most of their meals. She did more cooking for herself after Stein’s death, when financial mismanagement and wrangling over Stein’s will resulted in her living in poverty in Paris. Secondly, her section on living in the Bugey region in the French countryside during the Second World War is only partially truthful. In her dual biography of the couple, Malcolm sets out to answer why two Jewish lesbians who – although American and politically well connected – refused to leave the country, did not suffer the fate of tens of thousands of French Jews who were rounded up and deported to concentration camps. Stein’s flat in Paris was ransacked, but they survived the conflict in relative comfort. Both Stein and Toklas had conflicting feelings about their Jewishness, with Toklas converting to Catholicism towards the end of her life. Stein wrote admiringly of the wave of fascist politics which swept Europe during the 1930s. In the chapter devoted to the war in the Cookery Book, Toklas mentions visits from friends in the Resistance, but not those of their protector: Bernard Faÿ, an academic and, from 1940, the Director of the Bibliothèque Nationale. He collaborated with the Vichy government and was sentenced to a lifetime of hard labour in 1946, but escaped to Switzerland in 1951 (assisted, financially, by Toklas). I think that this is worth considering. There is, admittedly, a ‘so what’ quality to pointing out that Alice Toklas lied in her book: so what? It’s still an interesting and significant piece of writing. But as we conflate writing about food with being truthful, indeed with being extra-truthful, in the deluge of food- and recipe-based memoirs which have been published in the past decade or so, it’s worth noting that authors write about food to project particular ideas of themselves. Professing a love for food and cooking doesn’t render a memoir any more ‘authentic’ than one which focusses on baseball or fishing. Roland Barthes, Mythologies, trans. Annette Lavers (London: Vintage,  2000). Jeffrey Eugenides, The Marriage Plot (London: Fourth Estate, 2011). Janet Malcolm, Two Lives: Gertrude and Alice (New Haven and London: Yale University Press, 2007). 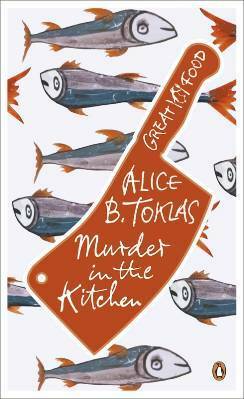 Alice B. Toklas, The Alice B. Toklas Cook Book (New York, Harper Perennial,  2010). Very interesting article as always. We think AS ONE! My mother mentioned this episode to me too, and that, partially, inspired this post. Thank you – I really must listen to it. In return, I suggest Will Self’s episode – also in Great Lives – on Oscar Wilde. It’s fantastic. Oh I agree – I listened last week. Excellent programme. This is interesting – is there something about the vividness of recall that good writers about food summon up which leads us to believe in their truthfulness? I think the furore over NIgel Slater’s memoir Toast is another good example. It includes an incredibly damning portrait of his stepmother, and after an adaptation was televised her daughters came forward to complain about its spitefulness and unfairness. Good grief! How fascinating. Did you follow the recipe exactly – there’s a weird mix of spices in it – or did you do your own version? I almost fell off my chair laughing at your friend’s description of the effects of the fudge. Thank you SO much for this: I had wondered about that recipe. It’s not like any fudge I’ve ever made. In the interests of full disclosure I should probably say that this apparently happened at lunch with Paul Bowles. He’s had a much more exciting life than me. But you have made and eaten literary fudge! That’s more than many of us have achieved. It’s definitely worth a go, even in the drug-free version. Maybe to end a Moroccan meal, with a large pot of mint tea. What an excellent idea – I think I shall.